Since 1987, Atlas Piers of Atlanta has been providing Atlanta and the surrounding areas with professional, affordable foundation repair services. Our well trained staff is always prepared to inspect your home and discuss the best solutions for you. We are dedicated to keeping your home and business stable and safe for you, your family, and your customers. We are the most trusted provider of foundation repair in Atlanta. Atlas Piers of Atlanta utilizes only the best Earth Contact Products in all our repair and construction jobs. ECP offers high-quality, durable steel products that will ensure the quality of your foundation repair job. ECP is “the very best” provider of foundation repair and basement waterproofing products across the country, and we are proud to use their products. As a locally owned and operated business with a service area spanning six different southeastern states, Atlas Piers of Atlanta prides itself on offering a variety of foundation repair solutions to fit your unique situation and budget. Our foundation repair in Atlanta services will help correct a number of the problems plaguing your home or business such as sloping floors, leaning walls, sticking windows, cracked walls, leaning chimneys, and settling garages. Whatever problem you may be experiencing, we have a solution. new construction underpinning. Want to prevent foundation failure while constructing your new home or business? Atlas Piers of Atlanta offers preventative measures with our new commercial construction underpinning and our new residential construction underpinning. You don’t have to wait for problems to occur – stop foundation failure in its tracks! 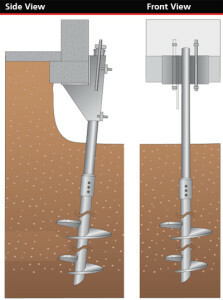 helical underpinning. Helical piers are installed in many Atlanta homes. These piers are screwed into the ground beneath your home, transferring the load of your house to more stable soil further down in the ground. This will keep your home from slipping when there are changes in the soil, and it will also correct any sinking that has occurred. pressure grouting. 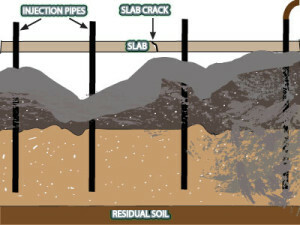 Pressure grouting is used when sinking soil causes large voids to form beneath your foundation, sidewalk, driveway, or garage. These voids provide no support for your concrete, making it sink and crack. This can be extremely dangerous. During pressure grouting, Atlas Piers will drill a small hole into your concrete and inject a high concentration concrete solution to fill the void and provide the support your home needs. carbon fiber repairs. Carbon fiber repairs are becoming increasingly popular because they are low-cost, eco-friendly, and minimally invasive. Carbon fiber strips are applied to your walls to strengthen them and correct bows, leans, or cracks. encapsulation. Encapsulation is the process of waterproofing your crawlspace. When your foundation shifts, it can allow excess moisture into your basement and crawlspace. This can cause mold growth and damage to the structure of your home. During encapsulation, a professional applies a vapor barrier to the walls of your crawlspace, sealing out any extra moisture that may enter. helical tieback installation. Like carbon fiber strips, helical tiebacks are used to correct bowing and leaning walls. 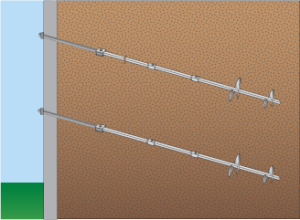 These are long rods and plates that are inserted diagonally through your wall and into the soil. This can decrease pressure from expanding soil and pull bowing or leaning walls back to their original position. Customers of Atlas Piers of Atlanta have praised the company for their honesty, their thoroughness, and their well-crafted foundation repair services. One customer claimed that, even after examining all options for a foundation repair provider, “Atlas proposed the best solution and value, and did outstanding work”. Another customer appreciated Atlas’ honesty, saying that, after a professional Atlas inspector came to survey their home, they were told that they didn’t need underpinning after all, saving them money and an unnecessary repair job. At Atlas, we pride ourselves on our customer service, and we will never suggest an unnecessary repair just to earn money. Our customers are our biggest priority! Click here for more testimonials from Atlas Piers customers. Atlas is affiliated with the Associated General Contractors of America, as well as AGC Georgia. We are a BBB Accredited Business. Contact us today for more information about our foundation repair services in Atlanta and the surrounding areas.